No favorite. They have all been amazing! Death Cab for Cutie, AC/DC, Eddie Vedder, Kid Rock, Counting Crows, Clint Black, Tim McGraw, Beyonce, pretty much all of it! I love creating an IPOD playlist for long runs. Currently on sabbatical from work. Pizza afterwards. Pop-tarts before. Roctane Gels during. Not really. Mostly do sports in my free time or read. 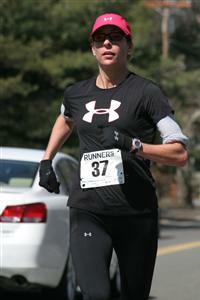 Somerville Road Runners and the Melrose Running Club- two fun, social groups. I like non-fiction & biographies. Just started Born to Run.. Try new things, go new places, meet new friends, and keep running! Chicago Marathon 2002. 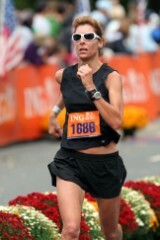 I ran my PR of 2:47:37 and qualified for the Olympic Trials Marathon by 23 seconds. My husband was at the finish line with my club coach and wasn’t sure I was going to make it as the clock ticked down. I had run the entire marathon at even mile splits- 6:23 pace every mile-- to make my goal of sub 2:48. I had built up no “cushion”, trying to conserve my energy. When the coach saw me turn the corner onto the final straightaway, he said to my husband “there she is!” My husband said something about me maybe not making it, to which the coach responded “once she sees that clock at mile 26, you are going to see her start sprinting.” And I did…although it was a tired sprint! It’s FUN! I learn a lot from the other pacers and runners in my group, and I love the challenge and responsibility of keeping spot-on pace. 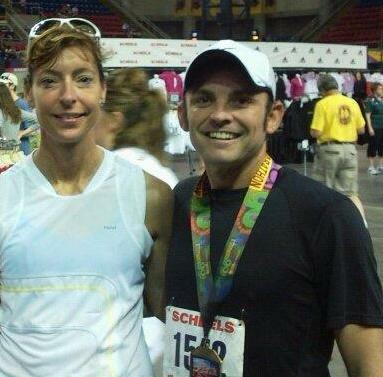 Plus, I get to meet other runners, see new places, and experience great marathon courses with my group. Madison Half Marathon- May 09. I paced the 1:40 half marathon group to a 1:39:51 finish. It was the largest group I have paced so far, and almost all of them stuck with me to the finish or went ahead at mile 11(as I encouraged the stronger runners.). Afterwards, the thank-you’s I got from my pace group made me feel like a million bucks. Staying on pace and tracking splits takes energy. Let me do it for you. I wear a Timex watch and a pace bracelet. As long as you stay with me, you will run even splits and get to the finish for your goal time. You can work with the group and focus on other things like your form, taking in fluids, and counting down the miles. Be confident in your training and try to relax during those early miles. Soak in the cheering fans. Introduce yourself to someone else in our group. Have fun! So many people talk themselves out of trying new things and achieving tough goals. It’s easy to make excuses and do nothing. You CAN DO what you set your mind to. If you just show up, take that first step, and do your best, it opens a whole new world of possibilities.